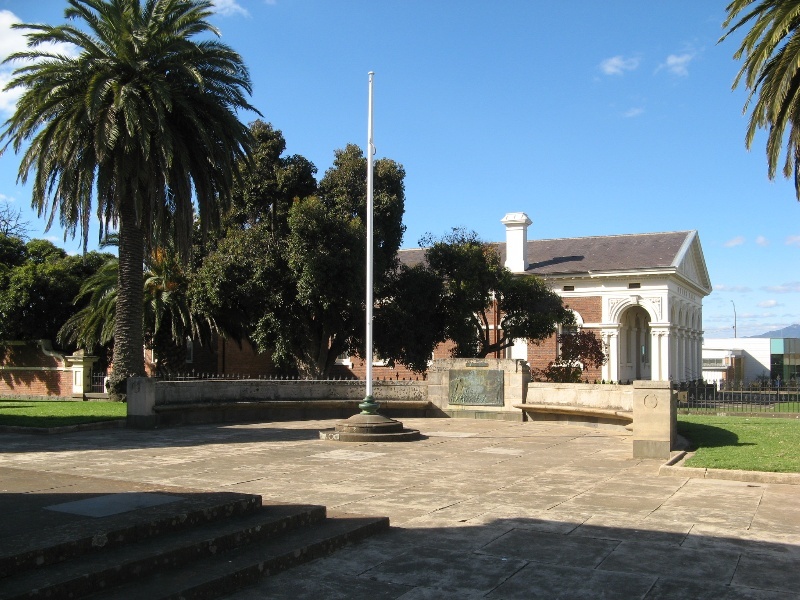 The Ararat Civic Precinct comprises the former Shire Hall (1871) and Town Hall (1899) together with War Memorials commemorating the Boer War, World War I and World War II in a landscaped setting in the main street of Ararat. Ararat was surveyed in 1857 following the discovery of gold in the area. A market square was reserved in the centre of town, and a market hall was built there in 1862 which became a temporary town hall in 1866. Part of the market square was later acquired for the Shire Hall, which was designed by the Shire Engineer Alexander White and built for use as municipal offices in 1870-71 by William Parker. A new town hall designed by the Ballarat architects Molloy & Smith was built by James Irwin in 1898-99 on the site of the old market hall. 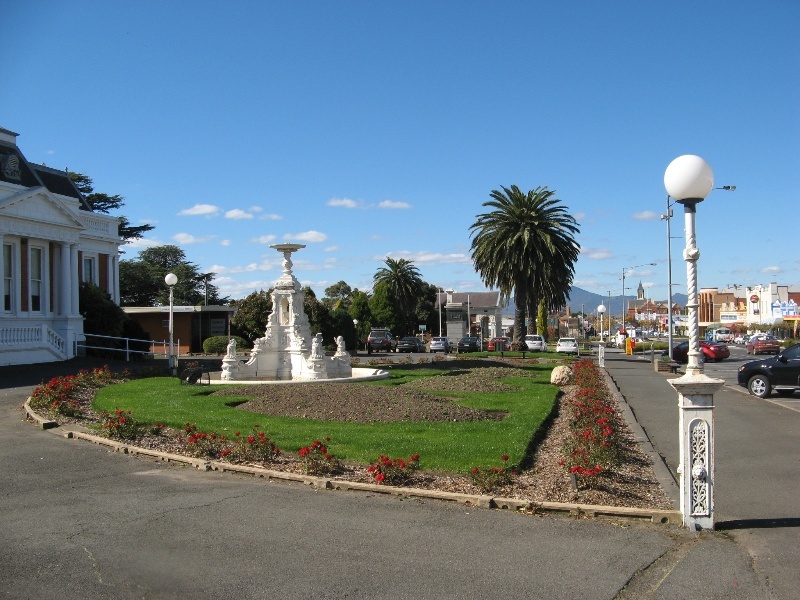 In 1905 a Memorial Fountain was installed in front of the town hall commemorating Ararat's volunteers in the Boer War. In 1906 a palisade fence (now removed) and elaborate cast iron lamp stands were added. A War Memorial modelled on the Cenotaph in Whitehall, London, designed by the architect A S Hall was unveiled in 1930. A row of palm trees was planted along Barkly Street c1931. In 1938-39 alterations and additions designed by the Melbourne architects Yuncken Freeman Freeman & Griffiths were made to the Town Hall. From 1957 the hall was leased for the showing of movies, and the funds from this enabled refurbishment in 1958. Council moved into new City Offices in 1967, and the Town Hall was converted in 1977-9 for use as an Art Gallery and Performing Arts Centre. The Ararat Civic Precinct is a prominent feature in the Ararat streetscape. The Shire hall is a single-storey symmetrical rendered Renaissance Revival style building, with an impressive arcade along the front elevation. There are later brick extensions at the rear. The Town hall is an impressive two-storey brick building with cement dressings in an eclectic classical style with Second Empire and Federation influences. There are red brick extensions to the north and east. The interior has been substantially altered though some original features remain. This site is part of the traditional land of the Martang people. 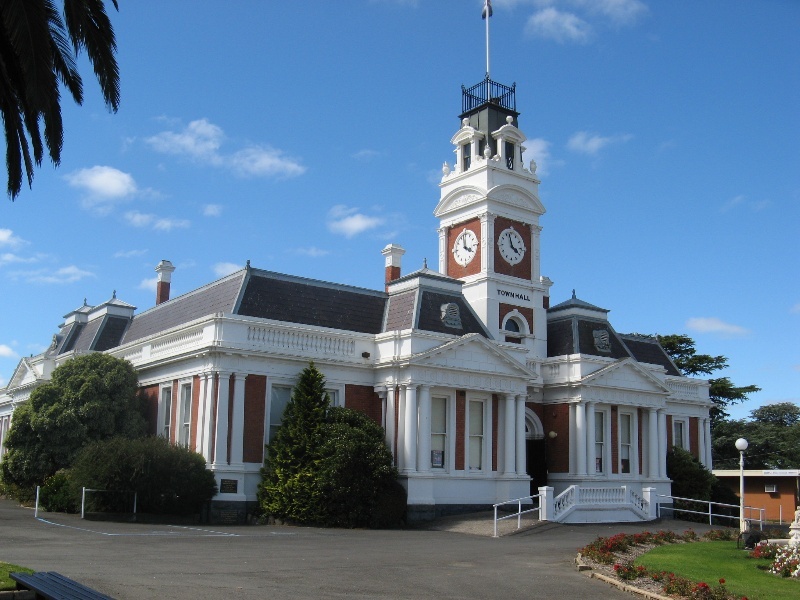 The Ararat Civic Precinct is of architectural, historical and aesthetic significance to the state of Victoria. 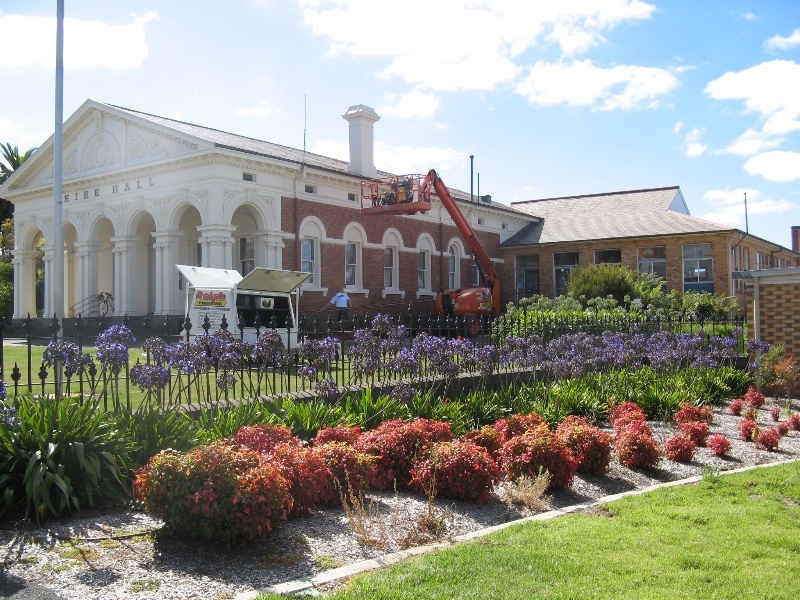 The Ararat Civic Precinct is historically significant as an expression of the wealth and community spirit of one of the more important municipalities to emerge from Victoria's gold rush era. The collection of war memorials was a response to local men killed in the Boer War and World Wars I and II and is a reflection of the impact of war on Victorian society. 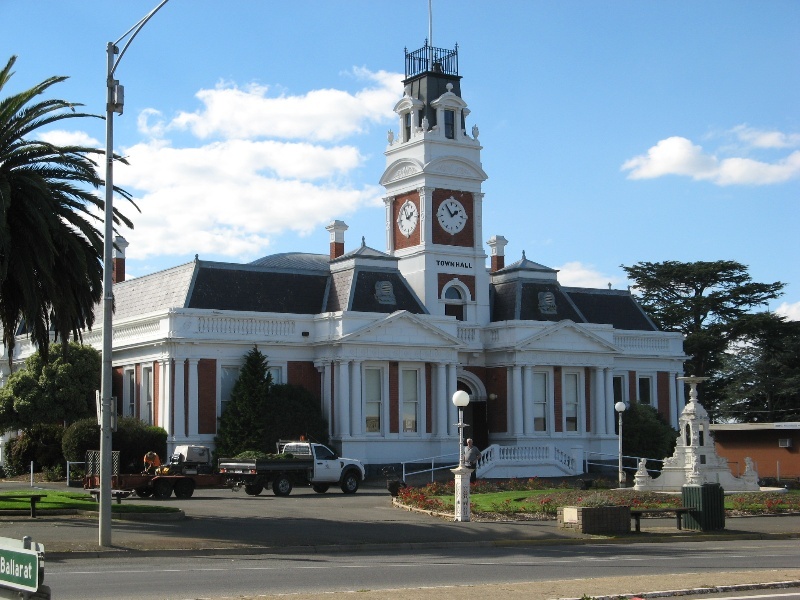 The former Shire Hall and the former Town Hall are both architecturally significant as outstanding examples of Classical style civic buildings, a style considered to be appropriate for such buildings at the time. The different use of classical elements in each case reflects the two periods of construction. The former Shire Hall is a notable example of a municipal building in a Roman Revival mode. 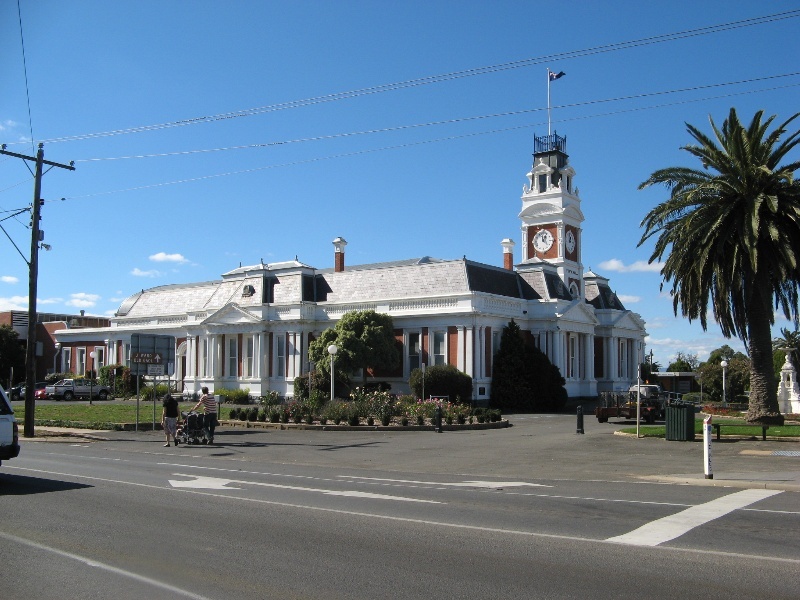 The former Town Hall, despite the lack of integrity of the interiors, is one of the most impressive late nineteenth century provincial town halls built in Victoria. The Ararat Civic Precinct is of aesthetic significance as for its collection of buildings and memorials in a landscaped setting. 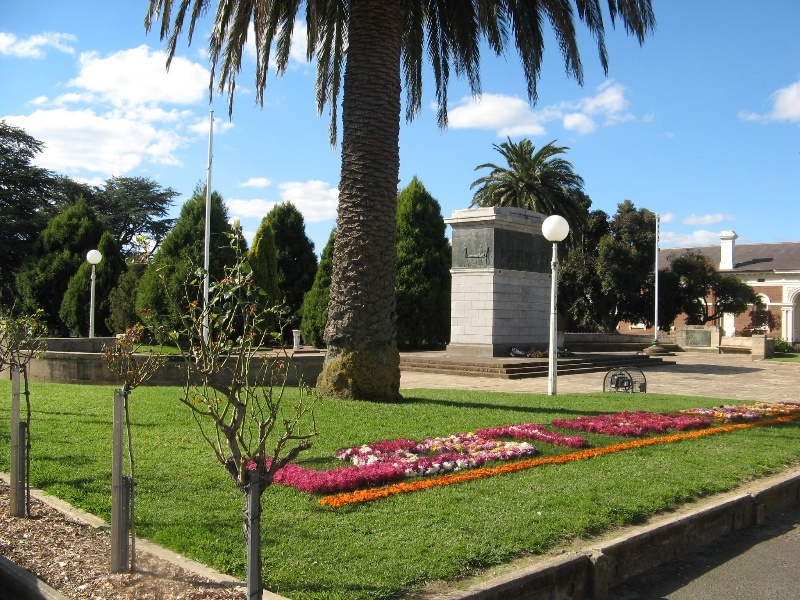 It is enhanced by its fine collection of memorials, the row of mature palm trees and the cast iron lamp stands along Barkly Street, and forms a prominent feature in the Ararat streetscape. 1. All the land marked L1 on Diagram 2286 held by the Executive Director, being all of Crown Allotments 21B and 21E, Section E, Township of Ararat. 2. 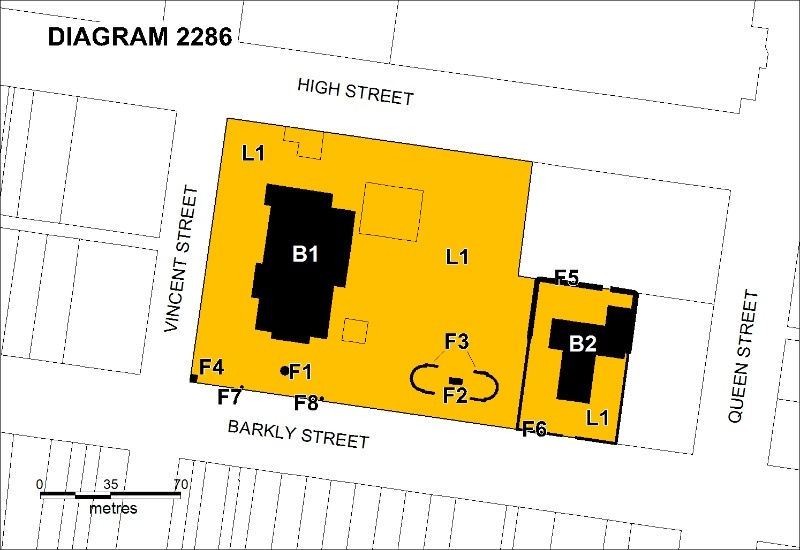 All the buildings marked B1 and B2 and features marked F1-8 on Diagram 2286 held by the Executive Director. The discovery of gold increased markedly the populations of inland Victoria and led to the rapid growth of regional towns. This was further influenced by the land acts of the 1860s, which led to an increased need for council services, especially roads, and the need for buildings to accommodate council functions. Handsome council chambers became an expression of local pride in developing towns. Shire offices were needed to accommodate indoor staff, and town halls were needed for a wide variety of civic and municipal functions and were the centre of local civic life. The two functions were often, but not always, accommodated in the same building. Ararat is in the wealthy Western District of Victoria, which was settled by squatters from the late 1830s, but the pastoral era was interrupted by the discovery of gold in the area around Ararat in 1854. In 1857 gold was found on the future site of the town of Ararat and more than 30,000 diggers descended on the area, but most had disappeared within a year. However the pattern of the town's streets was already appearing, and local traders organised roadworks in Main Street in 1857, before there was any form of local government. The town was surveyed in late 1857 and a plan of the town was produced in March 1858 and the first land sales took place in July. The Municipal District of Ararat was proclaimed in September 1858, and a council elected in October. Within six months temporary wooden council chambers were built. In March 1859 a deputation was sent to Melbourne to request sites for municipal buildings, including a town hall and council chambers. Ararat became a Borough in 1863. A large open space had been reserved in the centre of town as a market square, originally planned as a village green to be surrounded by shops and public buildings. Market sheds of brick with a gable roof were built by Council on the land in 1862, but remained largely unused. The controversial proposal to build a post office on the square in 1861 resulted in a Council resolution that no part of the reserve gazetted as a market place should be appropriated for any other purpose. The population of Ararat increased rapidly following the opening up of the area to land selection in 1862 and the Shire of Ararat was created on 8 March 1864. The choice of Ararat as the site of a large mental hospital in 1866 stimulated trade and employment. By 1867 the town had four churches, public and private schools and botanical gardens. By 1872 the Shire had a population of 6,557 and had 34,000 acres under cultivation, and ranked second in income in Victoria. The railway reached the town in 1875. 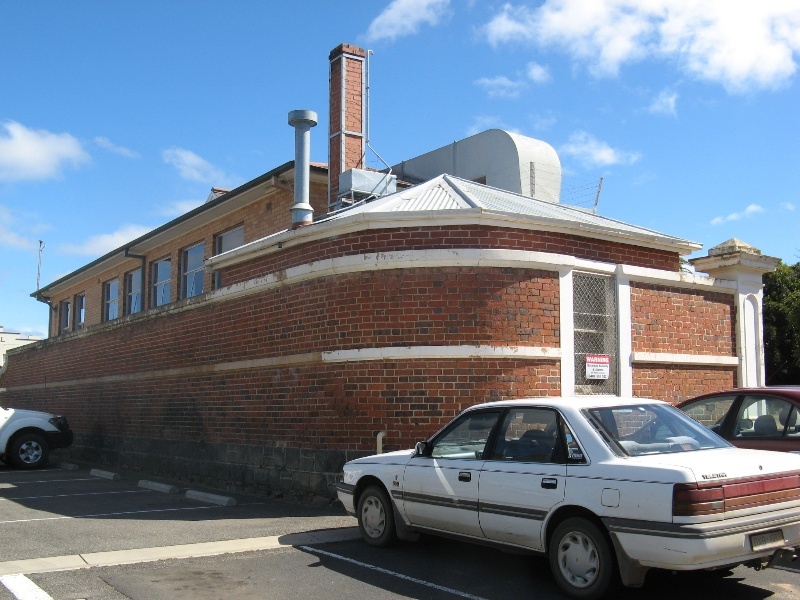 Only a month after the Shire of Ararat was created in 1864, the council determined to build a hall and offices on the Market Reserve in the centre of the town. However the resumption of this land was controversial, and was opposed by both by some local residents and also by the Lands Department. The market sheds in the square, which had been largely unused, were stripped, floored and plastered and re-opened in July 1866 as a temporary town hall, but served as Ararat's public hall for more than thirty years. Alterations and additions were made in 1872. William Parker's tender of £2,267/4/- was accepted and the foundation stone was laid on December 2, 1870. School children paraded carrying flags and marched to the site led by a drum and fife band and mounted police. Members of the Borough Council, Fire Brigade and Mining Board, Oddfellows, Rechabites, Masons, clergy, doctors and magistrates also joined the procession to the site of the hall. A scroll giving details about the shire, a copy of the "Ararat Advertiser", and coins were placed in a bottle under the stone. Afterwards the Shire President, Councillor Elliott, gave a banquet in the Town Hall. Members of Parliament, Presidents and Officers of neighbouring shires and the Mayors of Ararat and Stawell were invited to the opening of the hall on June 16, 1871. [After a ball in the Town Hall] the company proceeded along a paved path lit by impromptu lamps to the Shire Hall where the banquet was spread. 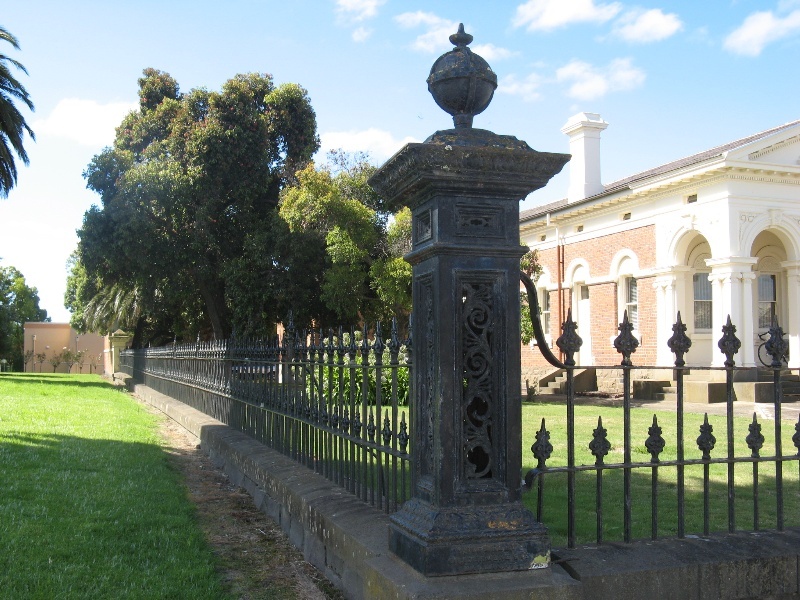 The fence and brick wall around the hall were added in 1872, the castings coming from William Blomely's foundry in Windermere Street, Ballarat. 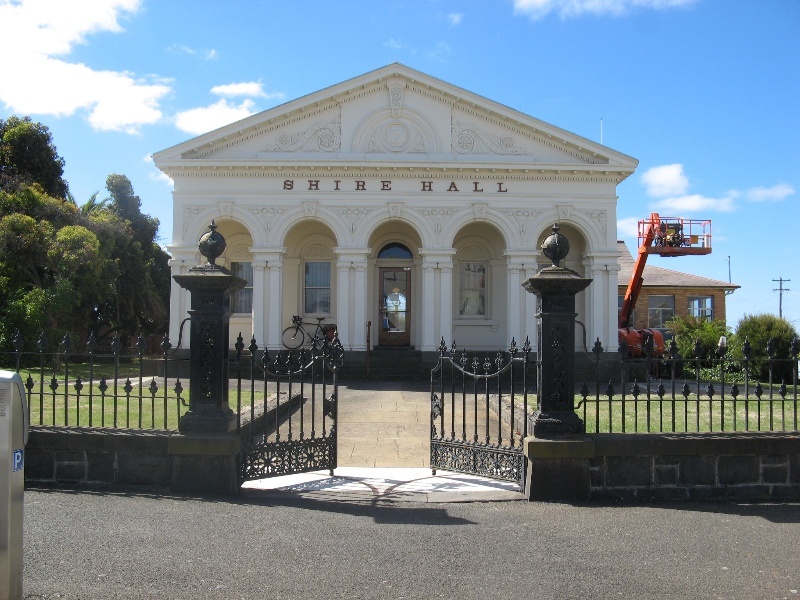 The Shire Hall was used as municipal offices, and was also used for official banquets, but the former market hall remained the main public hall in Ararat. The 1890s depression appears to have had less impact in Ararat than in other areas, and building continued apace in the town. Since 1887 the Council had discussed architects' plans for a new town hall. In August 1898 a plan submitted by Molloy & Smith of Ballarat was approved and the tender of James Irwin was accepted at £4,555. Irwin was the only tenderer for the removal of the old Town Hall at a cost of £215. In November the Mayor, Edward Simpson, laid the foundation stone. His successor, W H Elliott, opened the Town Hall on 18 October 1899. During the opening he interrupted the program to read a telegram giving news of the progress of the war in the Transvaal, in which twenty-one members of the Ararat and Moyston Volunteer Ranger Companies served. In 1938-39 alterations and additions were made to designs by the Melbourne architects Yuncken Freeman Freeman & Griffiths. These included the enlargement of the main hall and supper room to the north, improvements to the main entrance, changes to the foyer, introduction of amenities in the south-east corner, and the installation of a heating system and 'inside conveniences'. S A Edwards carried out the works at a cost of £8,000. An agreement was made in 1957 to lease the Town Hall for the showing of movies four nights a week, and the funds from this enabled refurbishment in 1958. With the completion of new City Offices in 1967, the Town Hall had other uses. The Ararat Art Gallery and the Ararat Arts Activity Centre occupied part of the building, which required substantial alterations, completed in 1979, designed by the architects Gunn Hayball Pty Ltd. The main hall was converted into an auditorium with retractable seating, the raised stage and proscenium were removed, a new foyer added on the ground floor, the east wing was altered for additional gallery space, the supper room was altered and the supper room and kitchen altered. Extensions were also made on the north and west sides. It was initially intended that the land around the town hall be beautified by the laying down of lawns and an ornamental shrubbery. In 1905 tenders were called for the excavations of the Town Hall Reserve, including rockwork edging. During the next twelve months substantial garden beds were laid out with rockery borders along the front (south) and east side. 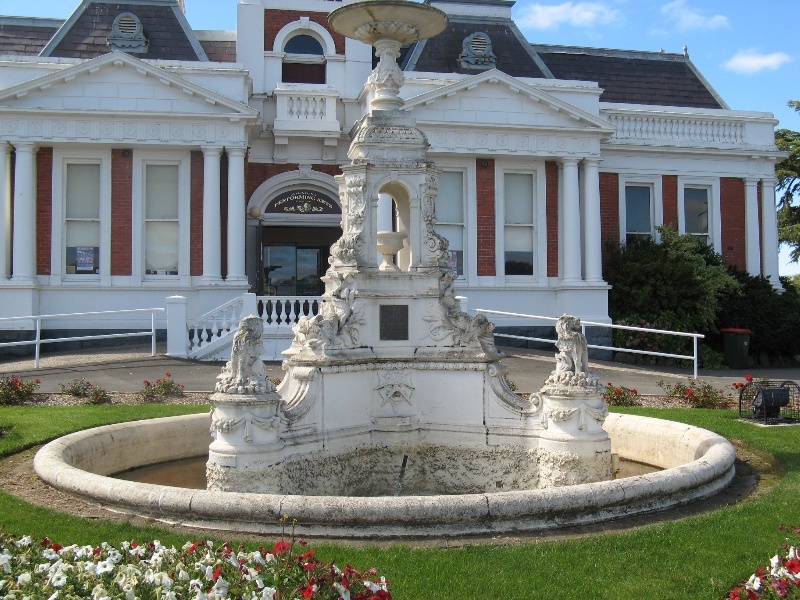 In 1905 a Memorial Fountain was installed in the front garden, commemorating Ararat's volunteers in the Boer War. 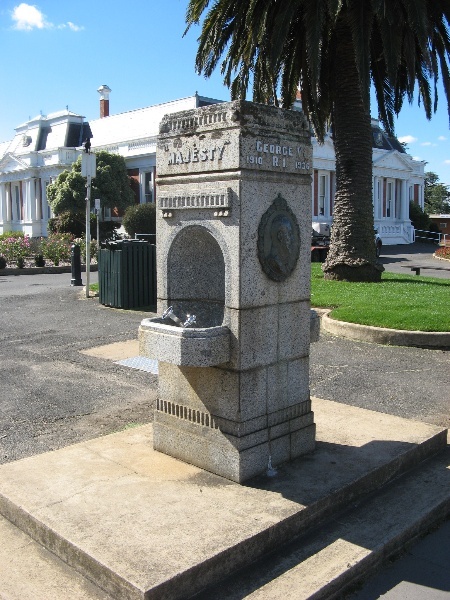 The fountain had been obtained ready-made, and was modelled by Wardrop & Scurry of North Melbourne. Fences were built in 1906 to prevent cattle grazing on the gardens. 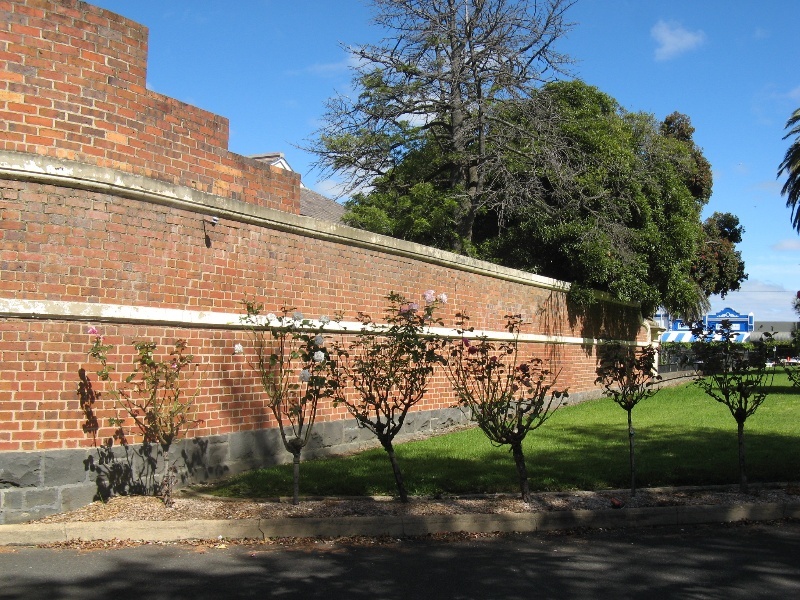 An iron palisade fence (now removed) on a bluestone plinth was added on the Barkly Street (south) side, and elaborate cast iron lamp stands added at each end (extant). A cannon was added to the east garden. In c1931 a row of palm trees was planted along the Barkly Street boundary. A rose garden was established in the front gardens around the Boer War Memorial in the late twentieth century. In 1989 these gardens were named the John Fox Gardens, in honour of the Council's gardener. A number of buildings were added to the site in the second half of the twentieth century. A tourist information centre was added in 1964 and a Senior Citizens Clubhouse in 1975. A modernist style library designed by the Melbourne architect Horace Tribe was built to the east of the Shire Hall in 1958, but this was significantly altered and extended in c2001. The Cenotaph War Memorial to the east of the Town Hall, unveiled by Major-General H E Elliott on 9 August 1930, records the deeds of those who fought in WWI. The architect, A S Hall, modelled this structure on the form of Sir Edward Lutyens' Cenotaph in Whitehall, London. 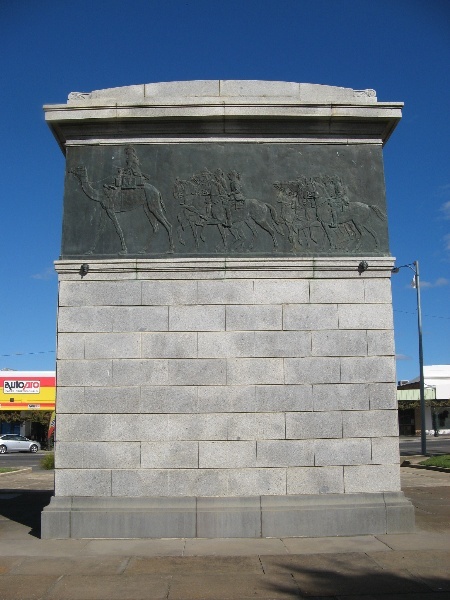 Bronze panels on a monolith depict Simpson and his donkey bringing in the wounded, soldiers going up the line, the Army Medical Corps and the Light Horse. The area around the cenotaph was further developed and landscaped after WWII, and a pair of semi-circular seats of Grampians stone with sculptured panels was added, illustrating a landing on a Pacific beach and Beaufighters (British long-range heavy fighter aircraft) in action. A memorial lobby in the Shire Hall was dedicated by the Reverend Chaplain J E Lloyd on 22 August 1954. It houses the honour rolls of both World Wars which were unveiled by Brigadier Hurley on the same day. The WWI Honour Roll is on the east wall, and a Book of Honour with the names of all Shire residents who served in WWII is in a pedestal on the west wall and is opened on days of remembrance. Wendy Jacobs & David Rowe, 'Former Ararat Town Hall, Barkly Street, Ararat. Conservation Management Plan', 2001. Lorna L Banfield, Sire of Ararat Its Settlement and Development 1864- 1964, Ararat 1964. 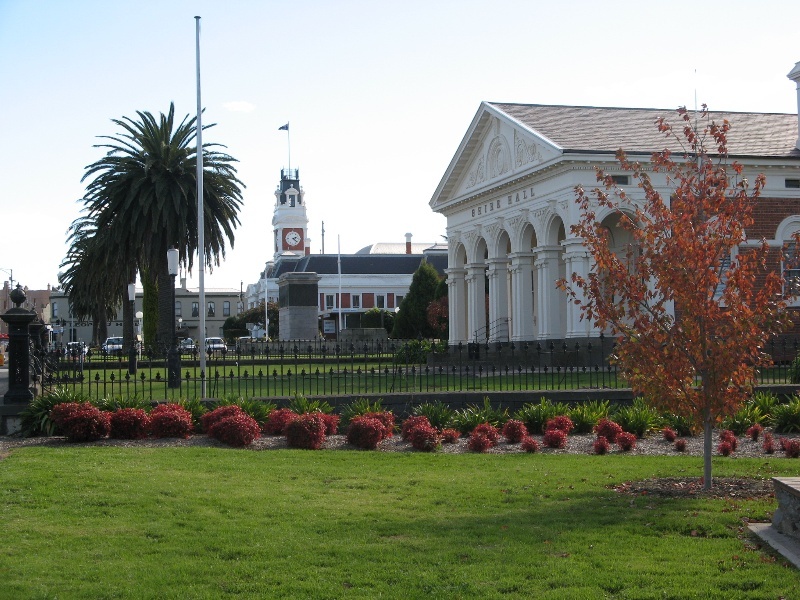 The Classical style original Shire Hall (1871) and the later Town Hall (1899), the fine collection of war memorials and the landscaped setting express the wealth and community spirit of an important gold rush municipality. General Conditions: 1. All exempted alterations are to be planned and carried out in a manner which prevents damage to the fabric of the registered place or object. General Conditions: 2. Should it become apparent during further inspection or the carrying out of works that original or previously hidden or inaccessible details of the place or object are revealed which relate to the significance of the place or object, then the exemption covering such works shall cease and Heritage Victoria shall be notified as soon as possible. General Conditions: 3. If there is a conservation policy and plan all works shall be in accordance with it. Note: A Conservation Management Plan or a Heritage Action Plan provides guidance for the management of the heritage values associated with the site. It may not be necessary to obtain a heritage permit for certain works specified in the management plan. General Conditions: 4. Nothing in this determination prevents the Executive Director from amending or rescinding all or any of the permit exemptions. Minor Works : Note: Any Minor Works that in the opinion of the Executive Director will not adversely affect the heritage significance of the place may be exempt from the permit requirements of the Heritage Act. A person proposing to undertake minor works must submit a proposal to the Executive Director. If the Executive Director is satisfied that the proposed works will not adversely affect the heritage values of the site, the applicant may be exempted from the requirement to obtain a heritage permit. If an applicant is uncertain whether a heritage permit is required, it is recommended that the permits co-ordinator be contacted. * The process of gardening, mowing, hedge clipping, bedding displays, removal of dead plants and replanting the same species, disease, vermin and weed control, emergency and safety works and minor landscaping works to maintain the garden landscape. * Removal of dead and dangerous trees which requires a list and plan to be submitted to the Executive Director. * Removal of vegetation, fallen timber and fuel reduction as part of an agreed Fire Management Plan. Note that the Vegetation Clearance amendment VC61 (known as the 10/30 rule) does not apply to places on the VHR and a permit is required from the Executive Director. * Replanting tree species to conserve the landscape character, conifer, elm, oak, and shrub plantings, provided a list and plan is submitted to the Executive Director for approval. 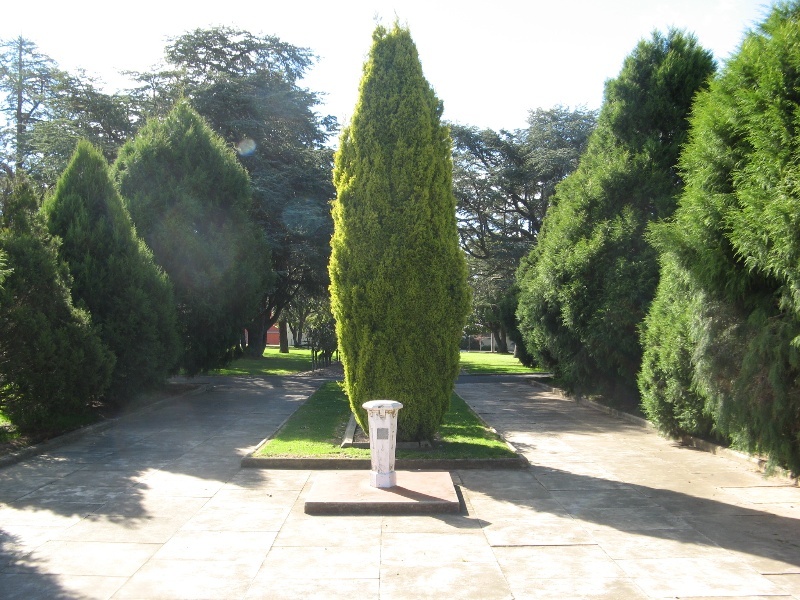 * Management of trees in accordance with Australian Standard: Pruning of amenity trees AS 4373. * Vegetation protection and management of the possum population. * Removal of plants listed as Prohibited and Controlled Weeds in the Catchment and Land Protection Act 1994. * Repairs, conservation and maintenance to hard landscape elements, paths and roadways, stone and concrete edging, walls, fences and gates. The purpose of the Permit Policy is to assist when considering or making decisions regarding works to the place. It is recommended that any proposed works be discussed with an officer of Heritage Victoria prior to making a permit application. Discussing any proposed works will assist in answering any questions the owner may have and aid any decisions regarding works to the place. A Conservation Management Plan for the former Town Hall was written in 2001 by Wendy Jacobs and David Rowe, which will provide guidance for future works. The extent of registration protects the whole site. The addition of new buildings to the site may impact upon the cultural heritage significance of the place and requires a permit. The purpose of this requirement is not to prevent any further development on this site, but to enable control of possible adverse impacts on heritage significance during that process. All of the registered buildings and structures is integral to the significance of the place and any external or internal alterations are subject to permit application. The c1939 and c1977 alterations and additions to the former Town Hall have had an adverse impact on its integrity, with all interior spaces being affected to some extent. Any original fabric should be retained.